On a visit to Fort Worth a few years back, a friend introduced me to the Rodeo Goat hamburger experience. After years of expanding, this unique burger spot has made their way to Houston, and I am one happy burger camper. Situated in the evolving EADO area of town, Rodeo Goat Houston does not disappoint. Sitting outside on a recent crisp late Saturday morning, I enjoyed the gravel patio setting flanked with tables and games. Perusing their menu of nearly twenty (!) burgers, the River Oaks CC spoke to my hamburger craving. My creation included a hand ground, American cheese, shredded lettuce, beef steak tomato, jalapeño bacon (my addition) and light mayo topped on a perfectly toasted multi-grain bun. Rodeo Goat proudly proclaims that their "beef patties are hand ground and formed, so they may be messier and juicier than anybody else's". That is 100% accurate. The flavorful patty combined the right amount of juices with the coveted charred crust. The spicy jalapeño bacon was a nice contrast to the sweeter taste of the bun. 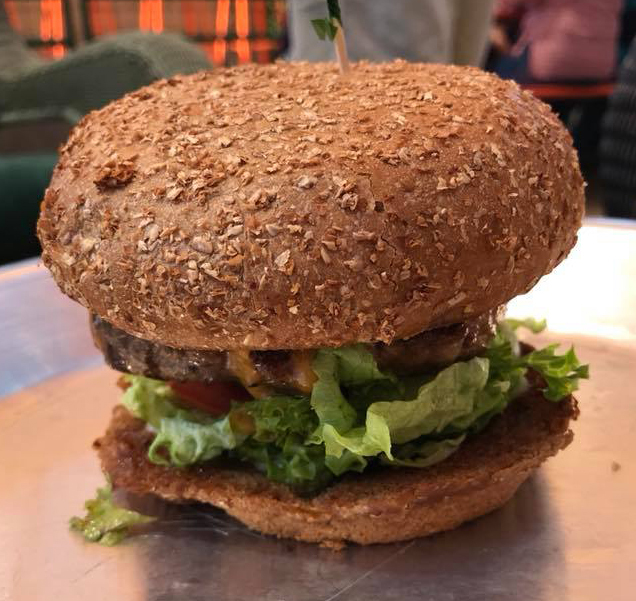 Adding a side of their crispy homemade Goat (potato) Chips, I enjoyed the quintessential burger experience on a perfect day. Vegetarian, fish and chicken options, as well as salads, offer alternatives if you are not in the mood for meat. Craft cocktails, beer, and homemade fried pies (I enjoyed the chocolate) round out their menu. All those I have sent to Rodeo Goat have come out with high praise for this transplant from North Texas. Welcome to Houston, Rodeo Goat. You have chosen the perfect town for Houston's "first rodeo".